Nellie Darling (NHS’11, M’21), who co-hosted and -organized “What Makes You More Than Medicine," an evening celebrating the artistic and diverse perspectives of the Georgetown University School of Medicine. (November 2, 2018) — Organized by Georgetown Arts & Medicine and the Office of Diversity and Inclusion, “What Makes You More Than Medicine?” brought together students, faculty and staff to express themselves through dance, song, poetry, spoken word, and even the culinary arts. 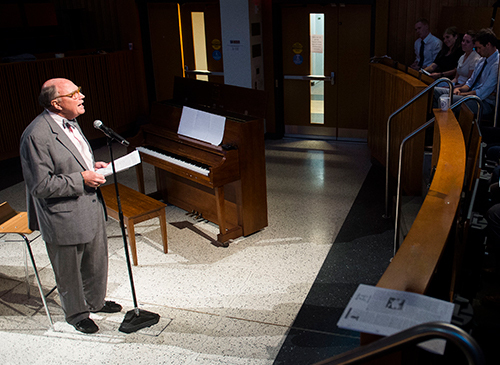 The October 22 event transformed the W. Proctor Harvey Clinical Teaching Amphitheater into an artistic forum, celebrating the creative talents of the Georgetown University School of Medicine (GUSOM) community and serving as a safe space for artistic expression on serious topics such as student mental health and wellness. Stephen Ray Mitchell, MD, MBA, dean for medical education at GUSOM, opened the evening by sharing his submission to Cura Conversations, a published collection of personal essays on identity written by members of the GUSOM community. In “Namaste,” Mitchell discussed his background as a clinician and educator, shared stories of some patients with whom he has worked, and offered advice to rising doctors on their journeys and interactions with patients. Nellie Darling (NHS’11, M’21) and Michael Paolini (M’21) co-hosted and organized the event with help from a planning committee that included Susan Cheng, EdLD, MPP, senior associate dean for diversity and inclusion at GUSOM, and a program manager who works with Cheng, Araba Dennis. Darling felt proud that the event brought together people from across the Georgetown University Medical Center community, including medical students in all classes and students in the Special Master’s Program in Physiology (SMP), as well as faculty and deans. “Wellness isn’t just making time for the occasional yoga class or buying an extra tub of ice cream for the week — although that doesn’t hurt. 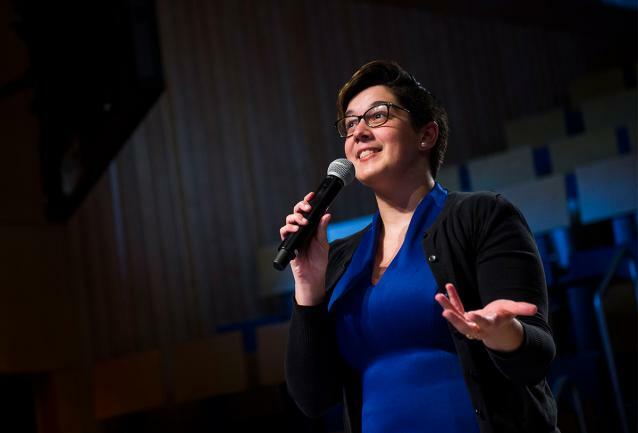 It is finding outlets for the creative side of your brain and opportunities to connect with others about those things that make you more than a medical student,” Darling said. Growing up in Albania, Griselda Potka (M’20) absorbed her parents’ work ethic, watching her mother work from morning until night washing dishes, clothes, caring for farm animals and cooking all of the meals, and listening to her father repeatedly say, “Don’t wait until tomorrow to finish what’s on your plate today.” After suffering a head injury, Potka was forced to slow down, she shared at the event. 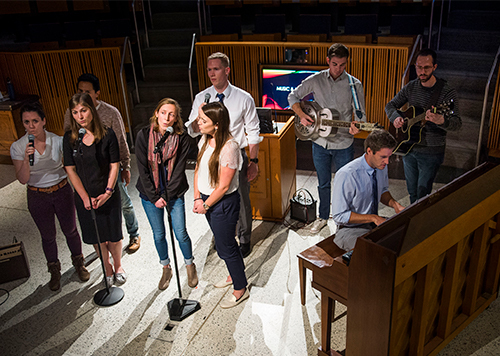 The creative talents of members of the Georgetown University School of Medicine community transformed the W. Proctor Harvey Clinical Teaching Amphitheater into an artistic forum. In her first semester of medical school, Potka was on her way to meet a friend and prepare for a genetics exam when a large vehicle rear-ended her Uber. She was taken to a hospital where a doctor diagnosed her with a concussion and recommended that she rest for a full week before she return to her studies. But after only two days of resting, she started to feel “lazy” and “inadequate,” craving the feeling of productivity. She decided to take her genetics exam early even though she had been given an extension — ultimately failing the exam. Since then, Potka has learned to be more forgiving and compassionate toward herself, recognizing that she will need to remind herself that self-care is vital as she continues her medical education and pursues a career as a practicing physician. Along with classmates Herminio “Jet” Navia (M’20) and Karin Collins (M’20), Marilyn McGowan (M’20), former president of Georgetown Arts & Medicine, performed two songs: “Yellow” by Coldplay and “I Can Change” by Lake Street Drive. She began her musical piece by explaining why she chose the songs. 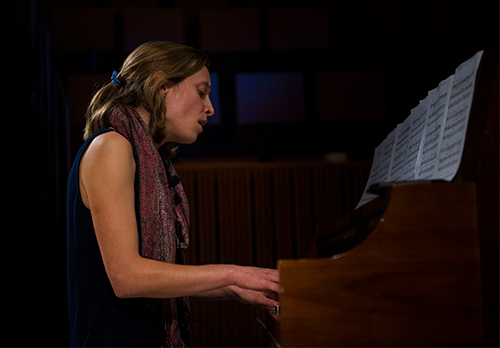 Marilyn McGowan (M’20) performed “Yellow” by Coldplay and “I Can Change” by Lake Street Drive.